The existence of the Ontario Harness Horse Association is in jeopardy after a decision by Ontario Racing to transfer track revenue to rival Central Ontario Standardbred Association as of April 1. The Ontario Harness Horse Association (OHHA) is vowing to fight a decision that it says, “if not reversed, will effectively end” the association by “withdrawing its funding” and allowing the Central Ontario Standardbred Association (COSA) to offer benefits coverage to all standardbred horsepeople in Ontario as of April 1. The decision to allow COSA to offer benefits province-wide and to direct OHHA’s track revenue to COSA was made by Ontario Racing (OR), the umbrella group that manages horse racing in the province. COSA has a seat at the OR table, but OHHA does not. OHHA, formed in 1961, currently represents horsepeople at most of the province’s smaller tracks. Annual OHHA membership fees are $12. COSA, formed in 2009 when OHHA failed to reach a contract with the Woodbine Entertainment Group (WEG), represents the horsepeople that race at Canada’s largest racetrack, Woodbine Mohawk Park. It is free to become a member of COSA. The majority of OHHA’s funding comes from a purse deduction of 1.5 per cent from most of the province’s tracks (other than Woodbine Mohawk Park). In its 2017 financials, OHHA reported membership fees amounted to $12,713 dollars, just 0.02 per cent of its total income of $763,122, of which $386,731 came from track revenue (the 1.5 per cent from purses). Hayes said, as of April 1, that track revenue money would go to COSA to run the benefits program across Ontario. “The OR board was of the opinion that those funds should be directed to COSA and the member racetracks of OR, rather than OHHA,” Hayes said. “COSA is the member on the board and we just wanted to be sure that those funds went to COSA to distribute to their members. COSA president Bill O’Donnell said, in addition to the track revenue, OHHA has been receiving some $25,000 per month — a total of $294,881 as reported by OHHA’s 2017 financial statement and listed under “provincial government contribution to member benefits.” O’Donnell said that money comes out of purses and that COSA will not need that money to manage the benefit program, leaving it in purses where it belongs. O’Donnell said he was told by the Ontario Lottery and Gaming Commission (OLG) that the additional $25,000 per month was due to end sometime this year and that his biggest concern was that when that money stopped flowing, OHHA might not be able to continue to afford to offer horsepeople benefits. “Do we want to see people without benefits? Absolutely not,” O’Donnell said. Even with the $294,881 in additional money to help fund benefits, OHHA operated at a loss of $28,881 in 2017. By comparison, COSA’s financials show a loss of $20,414 for 2017 and revenue of $601,066 from its 1.5 per cent cut of the purses at Woodbine Mohawk Park. Should the decision to transfer OHHA’s track revenue to COSA stand, using 2017 numbers as an example, the $386,731 OHHA received from track revenue would give COSA revenue of $987,797 to run the benefits program. O’Donnell and Hayes were interviewed by phone for this story. OHHA president Jim Whelan was offered the same opportunity, but he declined a phone interview, saying he would only agree to an in-person interview, despite a looming deadline and some 100 miles between himself and this story’s reporter. HRU was not prepared to give him special treatment. OHHA has been lobbying politicians to help them fight the decision. 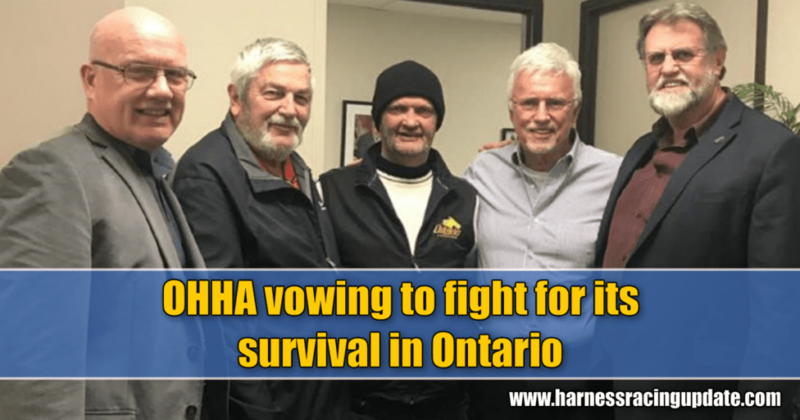 On Thursday (Feb. 7), OHHA’s Whelan, Tropea, Tom Bain and Mark Williams met with Chatham-Kent-Leamington MPP Rick Nicholls. Tropea’s Facebook page said OHHA had a meeting at the Ministry of Finance on Friday. Meanwhile, O’Donnell said COSA has changed its bylaws to be able to represent anybody in Ontario, not just those that race at Woodbine Mohawk Park. O’Donnell strongly denied OHHA’s contention that COSA was controlled by Woodbine. O’Donnell promised a seamless transition as of April 1 and the same membership benefits at COSA that people with OHHA now receive. One difference between the two associations is the fact that at OHHA, every member is entitled to a vote. O’Donnell said COSA does not allow caretakers to vote. “The only reason we don’t is because they are employees,” O’Donnell said, explaining that virtually no business allows its employees full voting rights to dictate how a business is run. As for what happens on April 1, O’Donnell was clear.